At this centrally located museum (downtown Lucerne on Pilatusstrasse) Paul Klee and Pablo Picasso are well represented. The later commands several rooms on the main floor and a few upstairs. A notable sidebar is David Douglas Duncan’s collection of photographs with the Spanish master and Jacqueline Roque—one of many women in his life and work. The highlight of those is the colour portrait, capturing Picasso as creatively virile even in his advanced years. In the lower gallery, 125 works (displayed chronologically and numbered for easy cross-reference to the details in the accompanying catalogue) from the prolific Swiss artist span his output over three decades (1910-1940). Worth the visit alone is Fisch-blick (Fish gaze, 1940)—a small frame full of emotion and possibility. Returning again to our musical themes, Auge und Ohr (Eye and Ear, 1929) curiously resonates with the semi-staged operas being presented in 2010 (cross-reference below), while Harmonie blau-orange (Harmony in Blue-orange,1923) has much in common with the abundance of works scheduled from Arnold Schönberg, Alban Berg and Anton Webern over the coming weeks. 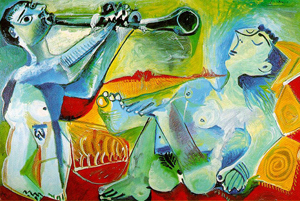 Up above, Picasso strikes a chord with Faune musicien (1952), L’aubade (1967 where the woman is marvellously serenaded—fill in your favourite tune!) and even Portrait d’un peinture d’après Greco (1950) which mutely supports the notion of so many “sound painting” conductors making their way to the KKL podium to add their stylized brushstrokes to someone else’s original canvas. 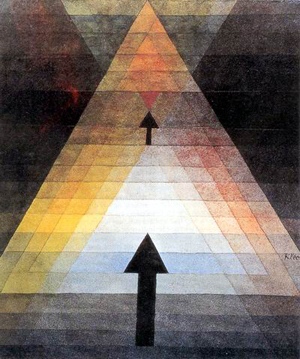 Speaking of Eros (but why talk about it when letting its magic take hold is far more satisfying), Klee’s 1923 work of the same name ties everything together in a time-warp knot whose silent messages are just as relevant decades ago as the ongoing bounty of music being performed today.